There are particular anime heirlooms that require a certain type of respect and admiration, especially when licensed merchandising invariably raises its head. Choujikyuu Yosai Macross is such an heirloom. Originally aired in 1982 as a 36 episode TV series, then as an adapted movie in 1984, Studio Nue’s epic-yet-human space opera is greatly revered. It also marked the creative debut of one Shouji Kawamori: a then meek mecha designer, he penned the timeless design of the VF-1 “Valkyrie”. Timeless in the way it looked like a contemporary F-14 fighter jet but also seamlessly transformed into a giant mecha to combat equally giant aliens out to destroy the human race. Unsurprisingly, there have been many Macross videogames over the 20-year period since Macross was created. Many have been utterly dire. A select few haven’t. Normally, the mere mention of SEGA-AM2 indicates a project of austere quality, after all AM2 truly have an enviable gaming portfolio. Bandai realised this state of affairs after releasing the (pretty poor) Macross Digital Mission VF-X games developed by UNiT, not to mention the shocking Macross Plus Game Edition and Macross M3 created by Shoeisha, and they thankfully commissioned AM2 to make matters right. Let’s get this clear from the start; SEGA-AM2 didn’t just make A Macross game, they made THE Macross game. In the history of the saga no one has managed to quite capture the essence of how a Valkyrie would fly; no one bar AM2 that is. Controlling a Valkyrie is exactly what you do in AM2’s outing, based upon the Aero Dancing engine, Macross already has a solid flight-sim as its foundation and it makes a massive difference to how the whole game pans out. At the heart of AM2’s Macross offering is a very solid, arcade styled flight-sim, in that the player flies around large areas whilst dispensing airborne targets with vulcan fire and missile salvos. Admittedly, there are certain modifications to the game type due to the Macross heritage, after all gritty mecha based ground battles are hardly staple fare for a flight-sim but the Aero Dancing engine has been more than adequately modified to accommodate this. Previous 3D outings into the world of Valkyrie piloting have also had to juggle the Valkyrie’s three modes: fighter, GERWALK and battroid. What normally happens is some form of haphazard balancing of the three modes, completely overlooking what the hell a Valkyrie does in the original anime. AM2 approached a Valkyrie as a fighter aircraft with an additional two modes. This focus is exactly where it was in the anime and it helps the game become more fluid and logical. By logical we mean that tactics employed in the anime – such as flying towards a group of enemies, launching missiles, breaking formation and transforming into battroid mode to shoot down the oncoming barrage of enemy missiles with your Valkyrie’s headlasers – actually makes sense now because it has been accorded proper functionality in-game. There is also a continuity in terms of reward as well; utilising your Valkyrie’s full set of functional nuances is the only way to attain high enough ranks to unlock further playable craft. You literally earn each more powerful iteration of the VF-1 by improving your skill (this is arguably an AM2 design trait and one that fits the context of the Macross saga admirably. After all, these pilots were phenomenally skilled). Another wonderful touch is the ability to walk upon the surfaces of battleships, something that is again faithful to the anime. 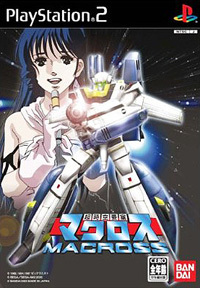 This approach to Valkyries as they are depicted in the anime is seen throughout AM2’s Macross effort. It is very clear, from the tearfully faithful recreations of famous battle sequences from the TV series and the movie, that a lot of love went into this game. So much so in fact that entire episodes from the TV series have been recreated in game form, making the whole experience that much more potent for the Macross savvy. No game is without its faults however, with only 20 missions in the game it is a little on the short side. It also lacks a versus mode. Admittedly, there are swathes of unlockables for those with Valkyrie piloting skill, but more gameplay would have been a preferable addition. There is also the rather irritating inability to fire off missiles whilst in battroid mode, a function commonplace in the anime. The reasoning behind this is clearly to help balance out the three modes and make the player utilise their Valkyrie to the fullest of their ability. Considering, though, the anally retentive attention to detail elsewhere in the game, this design decision somewhat jars. GERWALK mode is also rather tricky to handle but that is more to do with a steep learning curve than any deficiency in the controls (if anything they are overly comprehensive, especially in comparison to the other two modes). Overall, though, these faults are somewhat moot because the game itself is exemplary. It comes highly recommended to anyone who likes to fly through a piercing blue sky whilst dispensing alien minions in a graceful, transforming mecha ballet.